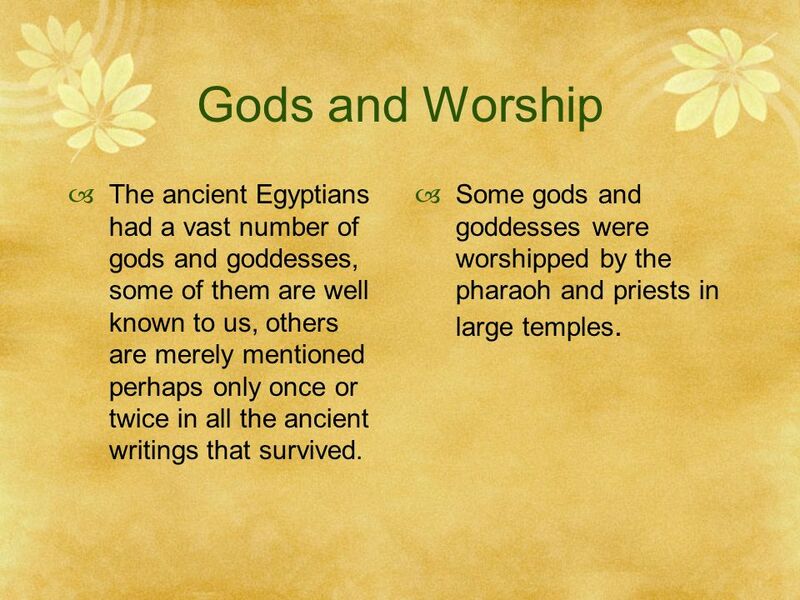 Ancient Egypt Gods & Worships. 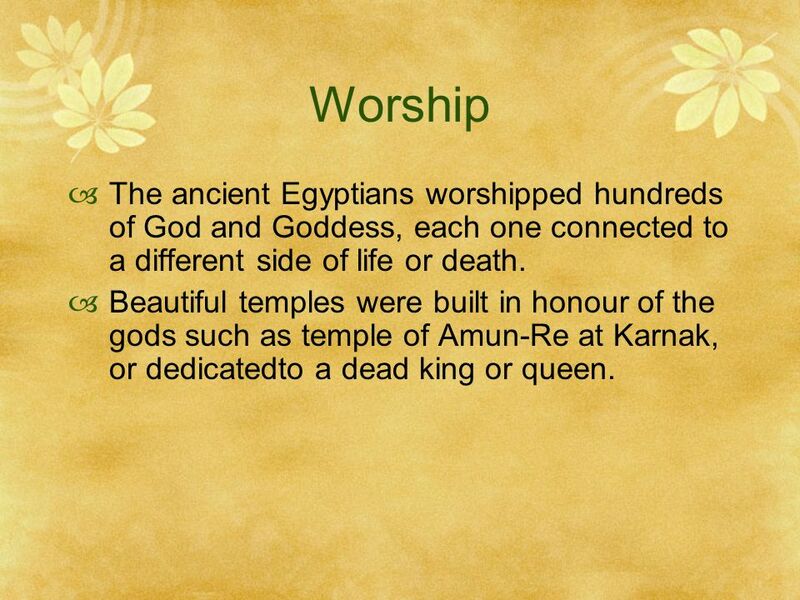 2 Worship The ancient Egyptians worshipped hundreds of God and Goddess, each one connected to a different side of life or death. Beautiful temples were built in honour of the gods such as temple of Amun-Re at Karnak, or dedicatedto a dead king or queen. 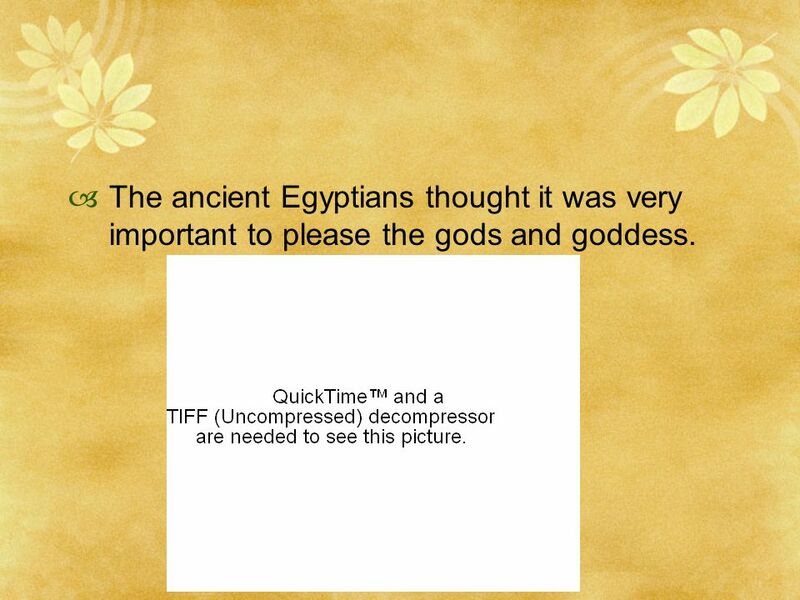 3 The ancient Egyptians thought it was very important to please the gods and goddess. 4 Temples! 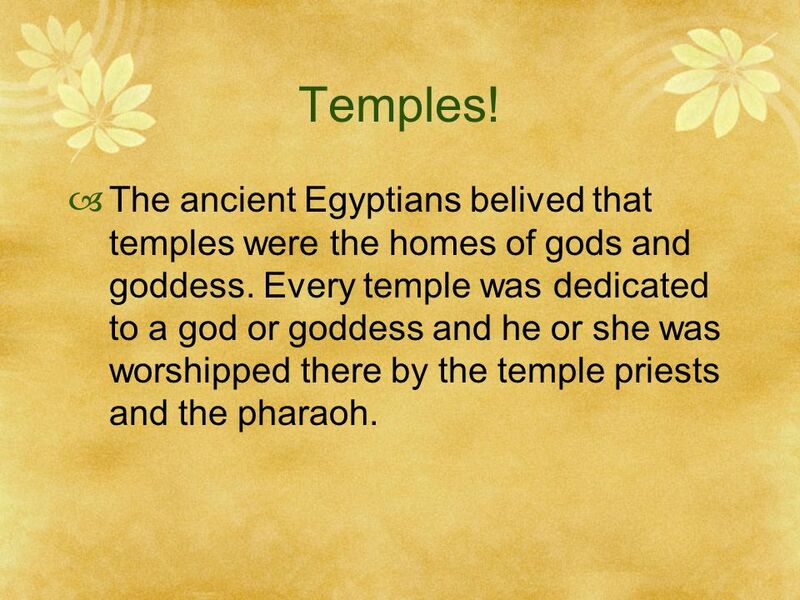 The ancient Egyptians belived that temples were the homes of gods and goddess. Every temple was dedicated to a god or goddess and he or she was worshipped there by the temple priests and the pharaoh. 5 Gods and Worship The ancient Egyptians had a vast number of gods and goddesses, some of them are well known to us, others are merely mentioned perhaps only once or twice in all the ancient writings that survived. Some gods and goddesses were worshipped by the pharaoh and priests in large temples. 6 Gods and worship. Some gods and goddesses took part in creation, some brought the flood every year, some offered protection and some took care of people after they died. 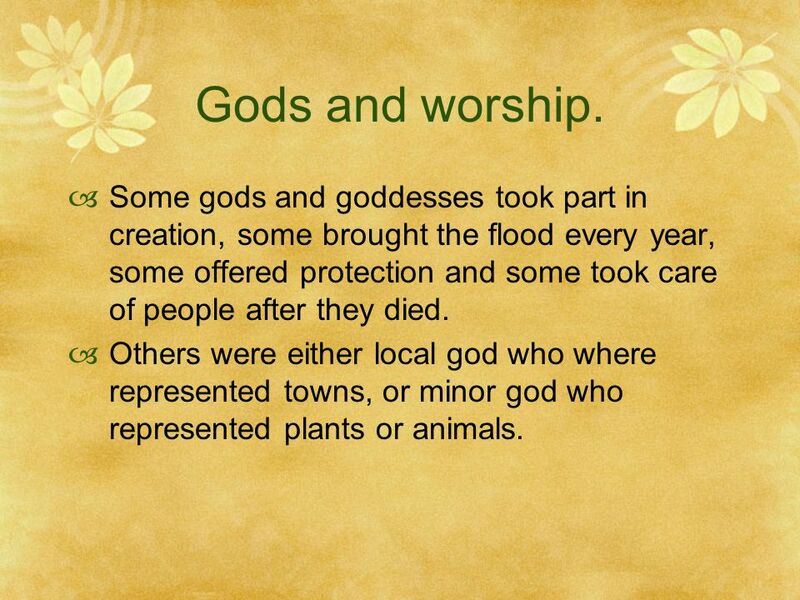 Others were either local god who where represented towns, or minor god who represented plants or animals. 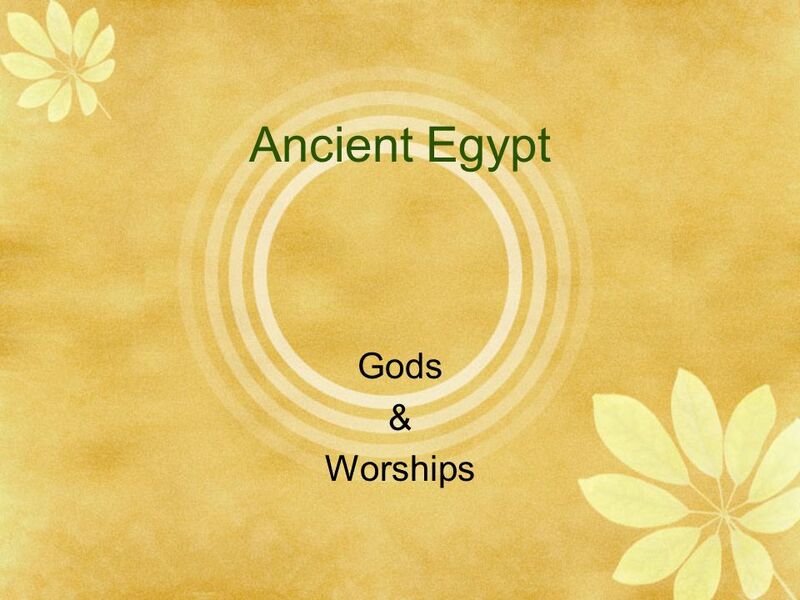 Download ppt "Ancient Egypt Gods & Worships." Egypt things that I researched. Why they love cats? They thought that cats were messengers from the gods and they were there to protect them from evil. Gods What are gods? What did some of the gods do? By Aoife Cahalan  Ancient Egyptian culture was started in 5500 BC and then it ended in 30 BC with the death of Cleopatra VII, the last ruler of Egypt. Life in ancient Egypt was not easy. How they did it? Read on and you’ll know. Ancient Egyptian Gods. In ancient Egyptian times, gods were extremely important in making the country run properly so the Egyptians worshipped gods for. 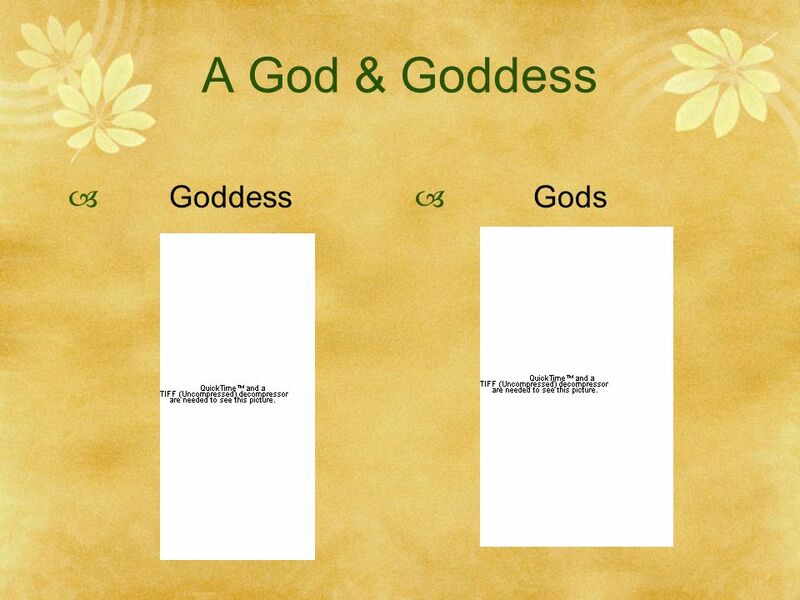 What was the importance of gods and goddess in Ancient Egypt By Johnny and Alex November 2004. Egypt. Predynastic Period (5200 BC to 2700 BC): First settlers of the Nile Valley hunt and fish, later switch to farming. Many kings rule the several. Egyptian Gods A Presentation for Mr. Kahn’s Class. 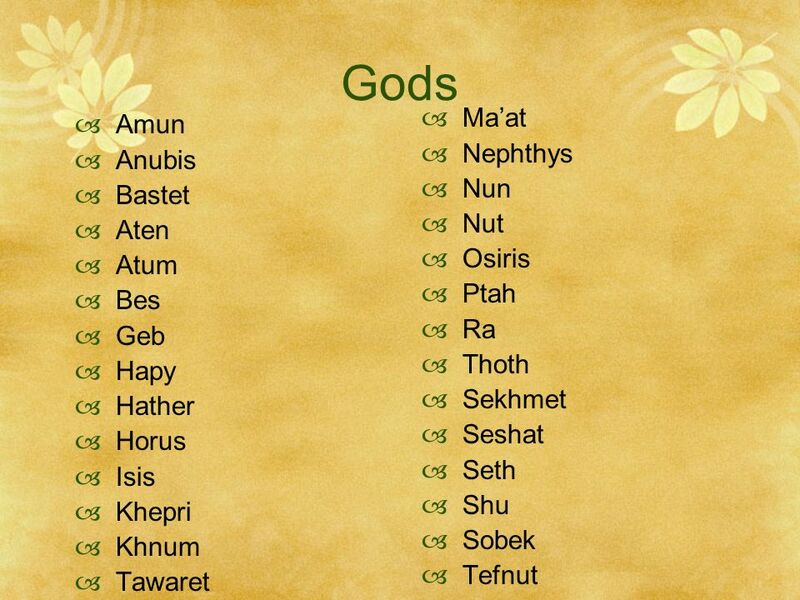 Egyptian Gods and Goddesses. Do Now Answer the following questions: 1. What area surrounded the Nile? 2. Where were Upper and Lower Egypt? Why was this? Major Gods And Goddesses Jared's Egypt Project. Amun, the God of Patron Amun was one of the most powerful gods in ancient Egypt. ANCIENT EGYPT By Claire Hennen and Tiva Knutson. Egypt Egypt is in Africa. What were the effects of gods and goddesses on Egyptian life? By Jordan, Tim, and Sammy November 2004. By Maggie EGYPTIAN GODS AND GODDESSES.  Ra was the primary name of the sun god. His Name can either be pronounced, Ra or Re. He was often known as the. Egyptian Creation myths There were four theories; however, each theory holds that in the beginning, only a primordial, stagnant ocean called Nu existed. Egyptian Gods 10 Gods Jassi Period 5. Ancient Egyptian Religion Ancient World History Mr. Blais. Ancient Egyptian Main Gods by Susan Mosley. In ancient Egyptian times, gods were extremely important in making the country run properly so the Egyptians.